I'm changing things up a little bit this month with my favourites. I've been busy trying and testing products and have quite a lot of new products that I haven't mentioned or reviewed on the blog yet. So to make it easier, I'm splitting up my favourites and doing a more indepth review of them, instead of having a paragraph about them all in one post. Today I'm talking about all things hair. I have a few older favourites and quite a few new favourites that I've been using in July. The night before I wash my hair, I always apply a oil onto the ends of my hair. It helps to give my hair an added boost of moisture and also helps to protect my hair when I wash it the next day. Because it can leave my hair greasy, I like to use a clarifying cleanser. Some clarifying cleansers can feel quite drying, especially on damaged and dry hair, but this one's fantastic! T&G seem to be having a lot of 2 for $20 promos at Priceline and supermarkets. I want to pick up their Sculpting Powder and Dry Shampoo. I've used this on and off for many years. It's great for anyone that doesn't like purple shampoos. It helps to get rid of the brassiness and makes blonde hair shine. I don't use it every time I wash, just when my hair is being brassy. It's gentle and works quickly, so it's perfect for when I'm in a hurry and can't be bothered applying a toner or purple shampoo for 5-10 minutes. These came in a pack of David Babaii products that I bought from TVSN a while ago (you can see what's in the pack here). I was really impressed with these. I've tried a lot of David Babii styling products, but had never used the shampoo and conditioners before. My hair is fine but damaged, so I find it hard to find products that aren't too heavy but are also still moisturising. I was really impressed with the shampoo. Even after using a clarifying shampoo (to get out the oil I applied earlier) then using this, my hair still felt moisturised and didn't get matted at all. The smell is beautiful. It reminds me of the Davidoff "Cool Water" (which I love) but if you don't like strong fragrances, it might not be for you. I love that these are sulphate free and colour safe. The range is also cruelty free! I've never used Royal Moroccan products before and have been really impressed with this mask. It's an intensive mask that helps dry and damaged hair. It contains argan and olive oil, so you know how soft and shiny your hair will feel after using it. 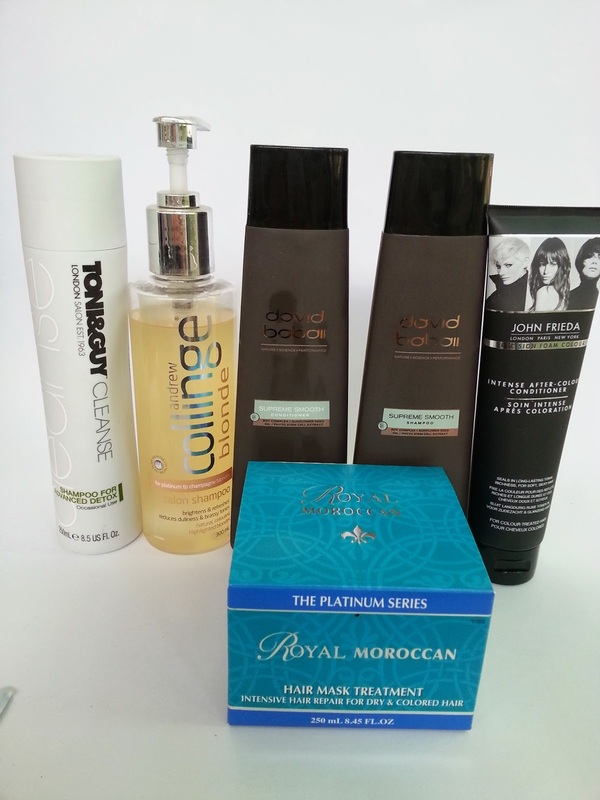 It also contains keratin and protein to strengthen and repair damaged hair. What I love about the mask is the fact that it works really quickly for an intensive mask. You only need to have it on for 5-7 minutes. The consistency is really strange. It's almost like a thick jelly that hasn't quite set. I like that it's thick, because there's nothing worse than a thin mask that runs down your back. A little bit goes a long way, so it will last a while even if you use it twice a week! It's quite scented, but I really love the perfume scent. The packaging is great too. It's in a plastic tube, so I don't have to worry about dropping it when I have wet hands. Now I really want to try out their shampoo and conditioner. This is one of John Frieda's newer products and it's a great inclusion of the line. It can be used at home to either extend the colour of a salon job, or to be used if you use an at home hair colour. It's the same conditioner that's in the John Frieda Precision Foam Colour at home hair dye kits. Because it locks in the colour, it's great for people who either wash their hair often (every day or second day) or use a bright colour that fades easily. It works in 2-5 minutes, so it's great for those mornings that I don't have time to use an intensive 30 minute mask, but my hair needs more moisture than a typical conditioner can give. This is the second bottle that I've bought. I really love applying a spray leave in conditioner as it's light on my hair and doesn't weigh it down or make it oily. This is also supposed to help with split ends and breakage, as well as reducing frizz and dryness. 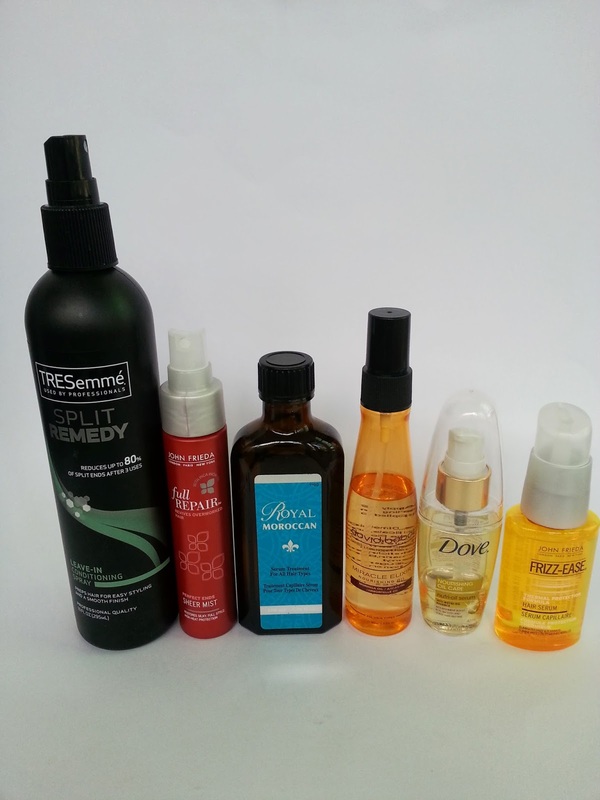 It claims to repair split ends up by 80% when using the other Split Remedy range products. I haven't used any of the other products so I can't comment on that claim, but I've noticed I do have less split ends even though it's been a while since my last haircut. I also own the Split Remedy Sealing Serum, but haven't used it yet. I'm looking forward to using it this month. I've been using heat more than usual, and this is a life saver!!! It helps to protect my hair from heat damage (sometimes I blow dry then curl my hair, so it's a double dose of heat!) and also makes it feel fuller. The packaging is amazing. It's actually a mist! I get so frustrated with heat protectors that squirt out in one spot. With this one, in just a few sprays, your hair is quickly protected evenly. I just wish that it was available in a larger size! This is such an great serum. It smells AMAZING. It's highly concentrated, so you only need the smallest amount (2-3 drops depending on your hair length). It cost $29.95 for 100mls, and will last months even when you use it daily. I apply it onto dry hair and my hair is left feeling soft, smooth, hydrated and it looks much glossier. The packaging is beautiful and it's in a glass bottle. I'm always extra careful when I use this, as I'm a bit of a clutz! I was a fan of the previous David Babaii oil, but I adore this mist version. It's so easy to mist onto your hair. Even though it's moisturising (and an oil) because it's a spray, it feels light on my hair. If you have oily hair, then this is a great way of still being able to use an oil. I just wish they had it in a larger size. I've previously reviewed this here, and I still love it. I prefer to use this at night and apply it to my hair the night before I wash it. It helps to moisturise my hair overnight and protects my hair when I wash it. It's so inexpensive and works so well. I've used JF products since I was in high school, and the Frizz-Ease original serum was one of my favourite products of theirs, and one of the very first hair serums that I ever used. This version not only helps to reduce frizz and leave your hair shiny and silky but protects your hair from heat damage. It also can help to protect your hair colour from fading. One of the things I love about this is it can also be used on dry hair, so even if I'm not using heat, I can still use this to help control my frizz. And those are my hair favourites for last month. I'll be posting my make up and skincare favourites very soon. What are your hair favourites? Have you tried any of these? PS You can see my June favourites here. 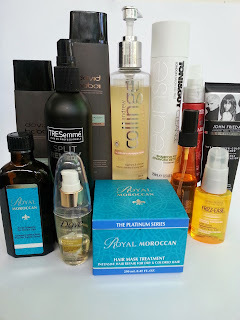 I really want to try out the Royal Moroccan mask and serum you talked about in this post. They sound wonderful! The moroccan mask sounds really nice!! I kinda need something like that!! Mindy- The mask is really nice. I'm still using a lot of the products in this post. The Royal Moroccan hair oil is amazing. I still have over half of the bottle left.